As we move deeper into the month of November, our thoughts begin to turn to the upcoming holiday season and with its arrival, comes shopping and traveling to see family, friends, and loved ones. In today’s hectic times, most of us make our travel plans and do our shopping online because it’s easier and we are able to do so in the comfort of our homes and on our own time frames. When Friends of the Wild Whoopers, (FOTWW) received its nonprofit 501(c3) status in 2014, we enrolled in some online giving programs so that we could receive donations generated by our supporters who shop and search online. The programs that we have been enrolled in are AmazonSmile, GoodShop and GoodSearch. Everyone is aware of the AmazonSmile giving program, but so many are unaware of the GoodShop and GoodSearch programs. For those who aren’t familiar with GoodShop and GoodSearch, let me try to give a short explanation on how both work. Both programs are easy to use and since we have been enrolled, our supporters who have signed up with the programs choosing FOTWW as their charity, have earned a total of $492.00 in donations for FOTWW and it was all done by shopping and/or searching online at no cost to you. GoodSearch is a search engine and works like Google or any other search engine. For every online search you make, they donate 1¢ to FOTWW. That’s all there is to it! Make 10 searches from their portal and we receive a dime donation. It may not sound like much but those pennies do add up throughout the year. Now about GoodShop. Everyone knows how AmazonSmile works and we can say that GoodShop works the same way, but is even better with 3,000+ partner stores to shop from. With AmazonSmile, charities receive ½ of 1% in donations on your purchase. That means for every dollar you spend at AmazonSmile, you generate ½ cent in donations. GoodShop gives you more freedom of store choices, travel arrangements and their percentages of donations are higher than AmazonSmile. Let’s say you are traveling for the holidays. From the GoodShop portal, you could choose Travelocity, make your reservations as usual and by doing so, FOTWW would earn a donation of up to 4% of your purchase price. Make arranges through Orbitz and the donation is up to 3.5%, and Expedia earns up to 5%. There are other travel sites, but these examples give you an idea about how it works. Do you like shopping at Walgreens, LL Bean, or JC Penney online? Through the GoodShop portal, your purchases from Walgreens would earn FOTWW a donation of up to 4%, purchases from LLBean, 2% and JC Penney, 3%. It’s that easy! 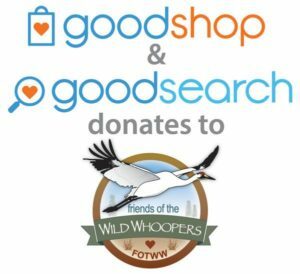 You shop and GoodShop donates to FOTWW. You may wonder why we are mentioning this. FOTWW is an all-volunteer nonprofit and all FOTWW staff members donate their time, energy and sometimes their own personal funds to keep you informed and to continue our mission to help preserve and protect the Aransas/Wood Buffalo population of wild whooping cranes and their habitat, including our “stopover habitat” project. So with the upcoming holidays just around the corner, won’t you please consider enrolling in the GoodShop and GoodSearch programs? All you need to do is go to their website, give them your name and email address, and choose Friends of the Wild Whoopers as your charity. Having been enrolled in the program for several years, I can assure you that you won’t receive tons of emails from them and your information is kept private. FOTWW thanks everyone who are currently supporting us through GoodShop and GoodSearch and to those who start using it, we thank you beforehand. If you should have any questions about these programs, please feel free to send us an email or post a comment under this article, and we’ll gladly answer them. Already using GoodShop and GoodSearch? Please share this with families, friends and coworkers who may not know about it.